Successfully Added Human Skull USB Flash Drive (4GB) to your Shopping Cart. Highly durable 4GB skull USB flash drive - transfer files in style this Halloween season. 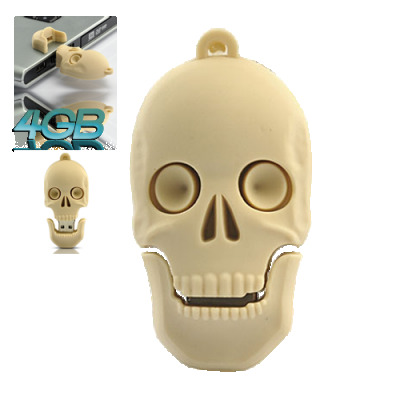 USB flash drives come in all shapes and sizes, but it doesn't get much cooler than a Human Skull shape. Made of a hard rubber that can endure drops and impacts from over 2 meters high, this USB flash drive is durable and convenient enough to be taken anywhere. The Human Skull USB Flash Drive is in stock now, so click "add to cart" and we'll ship it out to you within 24-hours. But be warned: Due to limited stock, once this item sells out, we will not be restocking. So get your orders in now!